As we approach summer, its time to get out your barbecue grills and start having some fun with them, especially around Memorial day weekend! Whether its camping or just a backyard bbq, there is always a thrill attached to grilling; in fact we absolutely love it! But as easy as it sounds, grilling is not everyone's forte. I am sure all of you must have had some good and bad experiences with barbecues; it serves to be one of the best events for a pot luck, meeting with friends, chilling out and having fun. A few simple pointers go a long way in making a bbq successful. I'd like to share with you some common tips and techniques about grilling, what bbq grills work best, what food to grill and how to make sure you are doing it right, followed by a beautiful Memorial Day BBQ Menu to get you going! I'm no expert at bbq, but we've had our fair share of grilling, and it has taught me a few tricks that will make an outdoor barbecue less stressful and more fun. If you are interested in knowing how bbq attained such a craze in US, here's a brief history about how bbq's originated. The first step, of course, is to buy a bbq-grill, and though there is a wide variety of products available to suit your style, I love the charcoal grill, especially for small-scale grilling. Buying a Grill: Though charcoal grills are still most widely used, I'd recommend a Gas or an Electric Grill (especially for first-timers) as they are the easiest to use and produce nice results. They burn hot enough to make distinct "char" marks and add the smokey flavor to your food. If you have to use charcoal, for picnics or camping, try to avoid the self-igniting briquettes. Though easy to burn, they can give the food a petroleum flavor. Basic Tips & Techniques: Grilling is a lot of fun, but not everyone can manage a great job the first time. Here are some general techniques to help you in your outdoor grilling venture. 1. Prepare the fire a half hour or more before grilling. For quick lighting, use a chimney starter with crumpled newspaper in the bottom and briquets or charcoal above. Or stack the charcoal in a pyramid shape and light with a liquid or electric starter. 2. First make sure that the grill is medium-hot. For most of the grilling recipes, the fire should be medium-hot with a single, even layer of coals lightly covered with grey ash. Less heat, and there'll be no "smoky " falvor to your food, too much high heat, and you'll practically burn and blacken your food! Also, adding a handful of aromatic wood chips such as mesquite, hickory, alder, or fruitwood chips over the coals can add whole new dimension of flavor to your food. 3. Make sure to clean the grill with a wire brush, and remove any previous residue food bits from the grill, before putting anything new onto it. Any burnt food chunks sticking to your main entree can so kill the taste! 4. Place the food item to be grilled on the clean grill. Be sure to put the presentation side down first on the grill in order to utilize the intense initial heat which guarantees the beautiful "grill marks" on the side that is visible on serving. Refer to some chicken breast recipes, if you like, for more pointers. 5. As the item cooks, move it around slowly so that it does not burn, and turn it over when it is cooked half-way. This is where the art of grilling comes in. The goal to perfect grilling is to give the item delicious dark brown (not black) grill marks on both sides and remove it from the heat without overcooking it. 6. To reduce the chance of overbrowning, apply tomato- based sauces or those containing sugar or other sweeteners only during last 20 to 30 minutes of grilling. 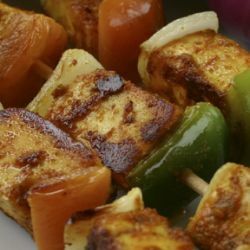 For grilling paneer, do not marinade for more than 20 mins before grilling or it will turn out soggy. 7. Try to space food so that it does not stick to each other and also shift items from the center of the hot grill over to the sides as you keep placing new food in the center. Closing the lid speeds up the cooking time and increases the smoky flavor, but also increases the likelihood of a small fire, so be careful. And remember to open the small air vent on the top of the grill if you decide to close the lid. 8. Use a pair of gloves and tongs to remove hot food from the grill to prevent yourself and your guests from getting burnt. 9. Position your grill according to the direction of the wind so that coal burns quickly and at the same time, your guests don't have to put up with the heat! A corner of the backyard is not always the best spot; wind governs where you place your grill! 10. Last but not the least, be prepared! Keep a suppy of charcoal and igniter fluid handy so you don't have to run in the middle of the bbq to get more coal. 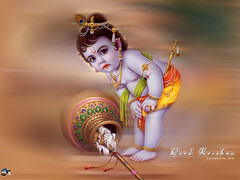 Once it loses heat, its very hard to bring it back to the right temperature again. Also, keep a first-aid kit handy for accidents and burns, especially with children around. Try to maintain a safe distance between the grill and the serving area to prevent random accidents. There are two methods to grill food over a gas, wood, charcoal, or infrared - direct or indirect cooking. based on what you are cooking, you should choose the method that the recipe demands. With the direct heat method, the food item is placed directly over the flame or coals. This method exposes the food item to very hot temperatures, often in excess of 500F or 900F for infrared grills. This is the fastest way to cook food items on a grill. The food items are cooked by the flames and radiant heat coming from the heat source of the grill.This method is ideal for grilling steaks, hamburgers, hot dogs, sausage, pork chops and skewers. All veggie and fruit skewers use this method. The food items must be carefully monitored so as to not burn them. With the indirect heat method, you place the food item so that it is not directly over flames or coals. This is done by having the fire or coals on only one section of the grill and placing the food items on the other side. In a charcoal grill, it is best to place a foil pan of water under the food to keep it from drying out. This method is best for large cuts of meat or bone-in poultry. It allows the food to cook all the way through without burning or charring on the outside of the meat. I hope this article can help some amateurs like me to host a successful barbecue event, or at least enjoy the experience of grilling. Once you master it, grilling can be wonderful and addictive! Use these basic tips and techniques to make your outdoor grilling & bbq a fun and relaxing event this summer! Wow, what a wonderful info. about bbq and grilling! It's really so useful for novices like me. Thanks Mansi! Hi Mansi great tips here. I have bbq'd pineapple before, but never considered grapes , apples. or pears. I know what Im trying tommorow! great tips mansi! its great that you thought of sharing these helpful tips to help others master the art of grilling! thanks again..
that's such a great post Mansi - we were huge BBQ fans in the US, and after we moved back to India, we don't even own a grill. It just seems too hot to sit outside and BBQ. But I miss the flavors and the entire social events around a BBQ! thank you folks! glad it was useful to at least a few people:) Bbq can be really fun and exciting, and we just love it! Great tips Mansi & can't wait for a little sun to bring out the BBQ. Cant wait until we get a new grill. Im so ready for it. Thanks for the tips, some of them we're using for years, but there are some good new ones I have to try next weekend. Also I have a little point I don't agree with: I can't follow your recommendation for gas or electric grills, even for beginners. I've tried both and it's just not the same. There is something missing and that's the unique taste you get with charcoal grill. Maybe because in my family there is not something like "beginners" when it comes to grilling. Since when we were little we had to look after the meat when the one grilling wanted to eat or had to go somewhere. i had another wonderful BBQ on sunday and we tried to barbecue fish. The last years I always had problems with it, but this year we bought an attachment which looks like a fish. You can put at least two fish in this gadget to get it well cooked. At the end you have a very good taste and your hosts will love you.